I've been a bad blogger. I confess. I'm sorry, please accept my apologies. Pretty please with a cherry on top. I know I said I would actually be posting personal posts last week, but I was so caught up in the family reunions and continuous lunches, I managed to write a grand total of zero posts. However, this week you are all lucky minions because I have a wee bunch of good'uns lined up for you. For those of you who like a little bit of a nose at others lives, I have this post full of my home adventures... if you're all for fashion and beauty, I have a Haul coming up for all the bits I've bought in England (I did a bit of damage in Primark) and if you are not only a member of the blogging community but also of the Youtubing guys and gals, on Monday I will publish a post about the weekend, as I am off to ITAtube in Milan, a big Youtube convention full of all your favourite guys and gals. So although I've been a little shy of my laptop in recent days, I promise you a full calendar for the upcoming week. Do you forgive me yet? I certainly hope so. So Alice, if you haven't spent the week blogging, hiding behind your laptop and hibernating from the world as per usual, what have you been doing? 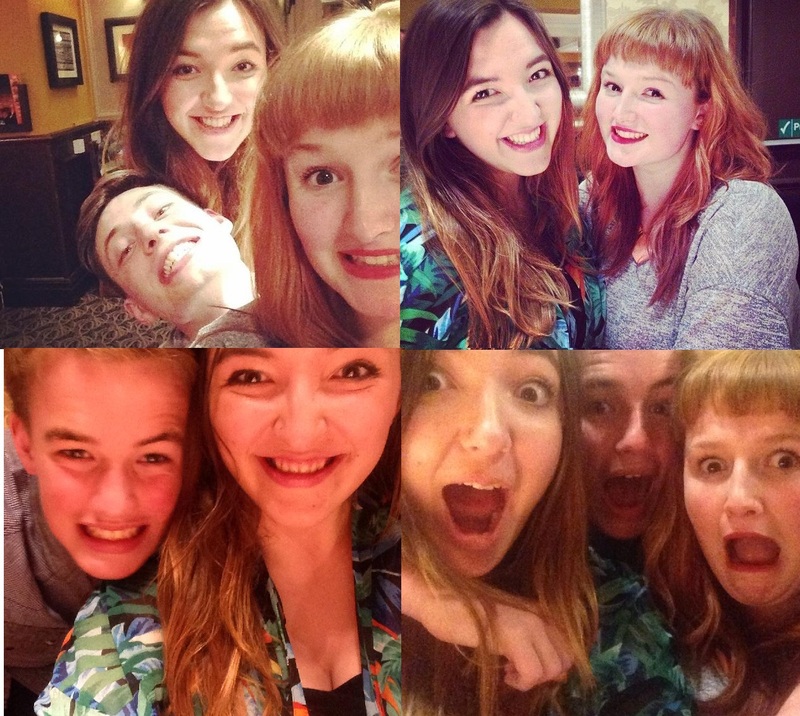 Well my little minions, I have been non-stop socialising and catching up with everyone humanly possible. From quick coffees to full on nights out, my life since stepping off the plane has been a series of friends, one after the other. Believe it or not, back in England I have real life friends, and this week I was in high demand. I'm sorry in advance for the camera qualities, every picture has been taken by my iPhone as I stupidly left my canon at home. 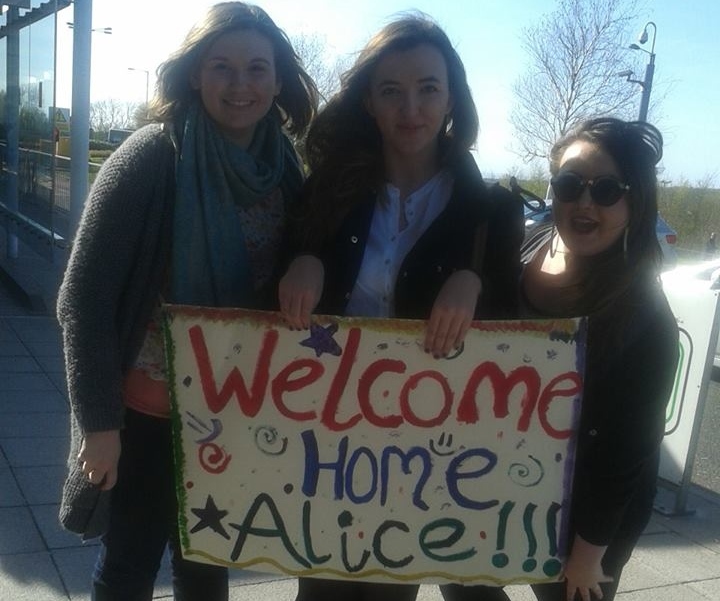 I stepped through arrivals to cheers and claps from my sister, her best friend (also a family friend) and my mum. Much to my embarrassment. Unfortunately a series of events over the last 48hours had made life a bit difficult so I had been travelling since 9am that morning and arrived in at about 5. I genuinely was absolutely overwhelmed to see my family for the first time in three months and although there were no tears, it did take a lot of will power. Then from 11am the next day, began the continuous coffees, lunches and outings. I saw all my closest friends and spent a lot of time swapping life stories, speaking terrible Italian and eating a lot. I think since being back I've probably put on five stone. When I saw one of my best friends Molly, I almost burst into tears at how happy I was to be drinking coffee with her again. On Friday, I boarded a train for Bristol, home of a lot of my closest friends but most particularly Charley. I've mentioned her a couple of times but if you haven't heard of her, her blog is here. Charley is doing the big move and heading up north to Lincoln with her lovely boyfriend Danny. Fortunately, her leaving meal fell on the weekend of my return and I couldn't resist popping up and seeing one of my favourite humans in the world, let a lone her family who are like a second family to me too. We ate far too much and when I passed out on my sofa bed at the end, I was definitely pushing the 'full' line between satisfied and sick. On Saturday I came back and after spending the afternoon with my oldest friend in the West Country, Kitty, I went to another of my best friends houses to get ready for Saturday night in Weymouth. As most of you are lucky enough to have never experienced a Saturday night in Weymouth, I suppose I should sum it up. It's a bit like a bear pit full of 'lads' in Kavos wife beaters in -10degrees and girls in leopard print from head to toe. But despite this, it is also where everybody goes out and if you drink enough at the start of the night (before you actually get there) most of the time you can end up having a good night. Plus there's the beach, and 99% of the time, you will end up on the beach eating your weight in chips. As was the case this weekend. I was actually excited to go out as nights out in Italy are not quite on the same scale as Wey'biza'. Sometimes I feel it's just a bit too classy for me, and luckily last weekend my longing for a £2 Jagerbomb instead of a €7 Mojito was fulfilled. Me and Emma (right) and me and Emily (left) We all became best friends on a school trip to Italy! From Sunday I have had a 'strictly family' couple of days. It's hard to explain to people who aren't close with their family, or who might not have particularly sociable parents, what it's like at Easter or Christmas. My family make a big deal out of every occasion, birthdays, anniversaries, Easter, Christmas, Valentines day. My mum even threw a Jubilee party one year despite not being particularly patriotic. To sum it up, my family just like any opportunity to celebrate and be merry and eat and drink a lot. And even though that might seem bizarre to some, I really love it. 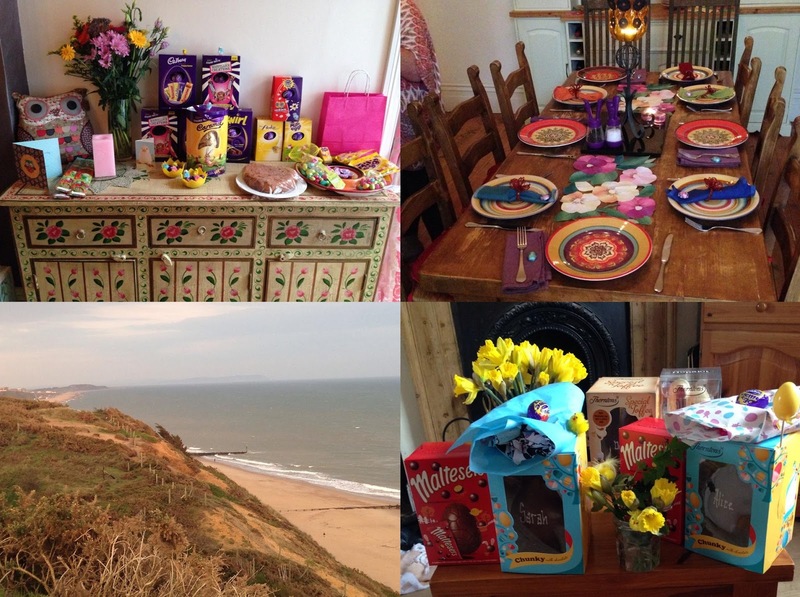 Easter was no different, we went over to Bournemouth to see my Aunty, Uncle, Cousins and cousins girlfriend, we exchanged Easter Eggs a bit like gifts, we'd all made or bought various desserts and cakes. We began by watching a couple of home videos of previous Easters, and then after a ginormous dinner and a walk along the sea we all settled in for an intense night of Singstar, and of course, my team won (can you tell I'm competitive)! Tonight is the last evening but even tomorrow before I leave at noon I have a couple of friends popping over to see me! What a busy bee. I've had such an amazing week catching up, and even though I love Italy I can't help but be a little sad to leave all my friends and family behind again. You will next hear from me when I'm back in my little Italian flat, having survived a Ryan Air budget flight (Hooray!!) I hope you all had wonderful Easters! Love this post very much,and your blog looks very cute!